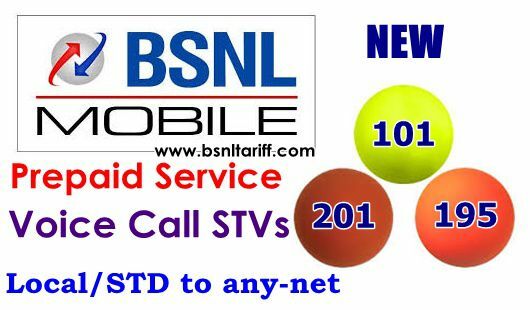 BSNL has launched new three Special Tariff Vouchers for making voice calls to Local and STD under Prepaid plan mobile segment as promotional basis. State run Telecom Company Bharat Sanchar Nigam Limited (BSNL) has introduced new Three Voice Call Special Tariff Vouchers for Prepaid users of Gujarat Telecom Circles as Promotional offer basis under Mobile services. New Voice Call STVs of Rs.101, Rs.201 and Rs.195 are introduced in Gujarat Telecom Circle for Prepaid plans users offers Free 10 thousand above seconds to both Local and STD calls to any network. Voice Call STV of Rs.101 offers Free 10100 Voice Call Seconds for both Local and STD to any network comes with 14 days validity. This STV will be available upto 08-02-2016 for Prepaid users. Another Voice Call STV of Rs.201 offers, Free 21000 Voice Call seconds for both Local and STD to any network comes with 28 days validity. This STV will be available upto 11-02-2016. Highest freebie seconds offered Voice Call STV of Rs.195 offers, 25000 Free Voice Call seconds for both Local to any network comes with validity for 28 days. This STV will be available upto 11-02-2016. The above STV will be available and applicable for 2G Prepaid / 3G Prepaid customers of Gujarat Telecom Circle as promotional basis.